I’m listing the camping related expenses as line item monthly averages. Then, I total everything else up and give just a general dollar figure. If you are researching fulltime RVing you already know what you pay for food, health insurance, etc. (or even if you don’t, my figures for such things won’t have any real world connection to what you spend on them). Also, by combining the non-RVing expenses I feel I’m better able to maintain our privacy. During the year we spent three months volunteering and receiving a campsite at no charge. For the purpose of this report, I’ve estimated the value of these months at $325 each. Also, we own a small car that doesn’t travel with us. We have it 4-6 months a year. That lowers our diesel use and adds a gasoline line to our expense sheet. During 2018, in addition to our months of volunteering, we spent a two months paying monthly rates. The rest of the time we were traveling, moving an average of just over one week. 2018 was a tough year for us financially. We did one major repair on our 5th wheel (over $5000!) and a couple of costly pickup repairs that drove our costs quite high. Also, we had some bigger medical costs this year, driving up our “just living” numbers. Other expenses are drifting upwards, primarily, I think, due to inflation rather than any big changes in our lifestyle. One takeaway here is that if you stay in the fulltime lifestyle long enough you are going to have some big, undesirable costs – the same as can happen if you live a more conventional lifestyle. If you get in by stretching your finances to the limit, sooner or later, you will face a financial crisis. This year our reserves were hit hard, but we are thankful we had those reserves to draw from. Hopefully, 2019 will be kinder to us, allowing us to recover a bit. PS: If you find this information helpful, please leave a short comment so I’ll know it is worth the effort needed to provide it. Thanks. Our 2018 Adventure included lots of travel. We towed the 5th wheel over 5100 miles, visiting 34 campgrounds in 17 states. Our average travel day was 150 miles and our average stay was about 11 days (although that is skewed a bit because of two longer winter stops). We had lots of opportunities to enjoy our upgraded Thousand Trails membership, spending 120 nights at their properties. Our membership saves us a lot of money and much of my travel planning consists of stitching together a route that includes these campgrounds. We also stayed 45 nights in Corps of Engineers campgrounds. These are our favorite campgrounds: almost always well laid out, spacious, and in beautiful locations. With our America the Beautiful pass we average paying $11-12 per night. Really, the CoE campgrounds spoil us for staying in tighter, urban campgrounds. If there is any negative at all it is that these campgrounds often offer only water and electric hookups and are generally rather out of the way, off the beaten track. Generally speaking, we like alternating our stays between campgrounds right in the middle of the action and quieter, more laid-back spots. That approach was really evident during our two weeks at Acadia National Park in Maine. The first week we were in a commercial campground located in the heart of the action on Mt. Desert Island. The second week we were at Schoodic Woods campground located in the “quiet side” of the National Park. That week was our favorite week of the entire summer. In fact, we enjoyed our month in Maine very much. It is a beautiful state with friendly people. We also spent quite a bit of time in Pennsylvania. We had been there before, but this stay was longer and we had time to get acquainted with more areas. It is a great state to visit with lots to see and do. One change for us is that after volunteering at Battleship Texas and San Jacinto Monument the past several years, including the opening months of 2018, we decided to take a break upon our return to the Houston area. Instead we settled into a residential RV Park in Dickinson, TX for a few months. This year, in spite of the enjoyable travels, wasn’t trouble free. Right off I knew I needed to take the 5th wheel in to the factory for service. It was a major repair and rather expensive. Then, in Indiana I had the pickup in the shop. I knew the repair was coming, but there was another big hit to the bank account. A couple of months later the pickup was back in the shop not once, but twice, for both maintenance and work again. All in all, this was our most expensive vehicle/5th wheel year to date. These expenses will be obvious when I release our 2018 expense sheet in a few weeks. 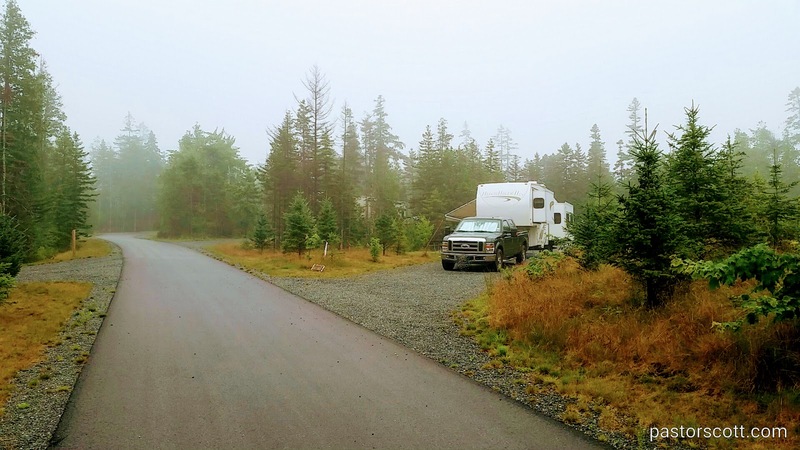 We’ve been reminded in unwelcome ways that traveling in a RV doesn’t take us away from real life as we’ve had our share of doctor’s visits and expenses. Happily, the outcomes to this point have been reasonably good although the final chapter hasn’t been written on some issues. One silver lining to these clouds is that we’ve had a chance to affirm that traveling fulltimers can walk into most any Urgent Care and get help. Another is that all the money we spend on insurance actually gets us decent coverage. Still, I’d rather just buy the insurance without needing it! We still enjoy the nomadic RVing life and hope to continue for the foreseeable future. With both 5th wheel and pick-up being in the shop this year we’re thinking about doing some trading, likely to a motorhome. However, at this point we’re just thinking about it. Stay tuned on that front.